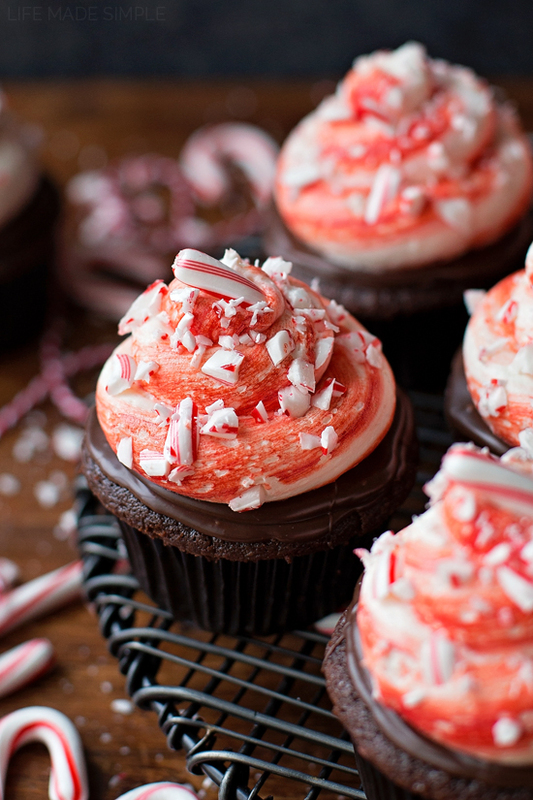 Embrace the holiday season with these festive chocolate peppermint cupcakes. 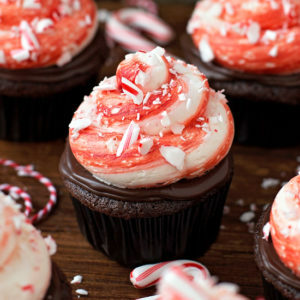 They’re topped with ganache, peppermint buttercream and crushed candy cane. I absolutely love making cupcakes, but it’s not something I get to do very often. We have a small family, so eating an entire batch is almost impossible. That all changes when the holidays roll around. Suddenly we have a long list of friends and neighbors to deliver treats to. These chocolate peppermint cupcakes are something different, not your standard sugar cookies, fudge or nut clusters. They were the perfect addition to our goodie boxes. I used my favorite chocolate cupcake recipe for the base (although a boxed mix would work too). As the cupcakes were cooling, I made the ganache- it’s all done in the microwave. After spreading a thick layer of ganache over top, I got to work whipping up a batch of peppermint buttercream. To make the candy cane swirl, I grabbed a extra large piping bag fitted with a large tip, a toothpick, and red gel food coloring. Using the toothpick, I swirled the gel in the bag, then filled it with frosting. The fun swirl appeared as the frosting was pipped on. Such a fun little trick, don’t you think? All that was left to do was add a pinch of crushed candy cane on top. 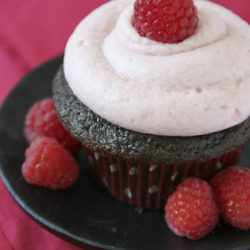 These chocolate peppermint cupcakes would be a great party treat or neighbor gift. 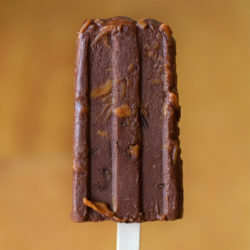 They’re decadent yet refreshing! 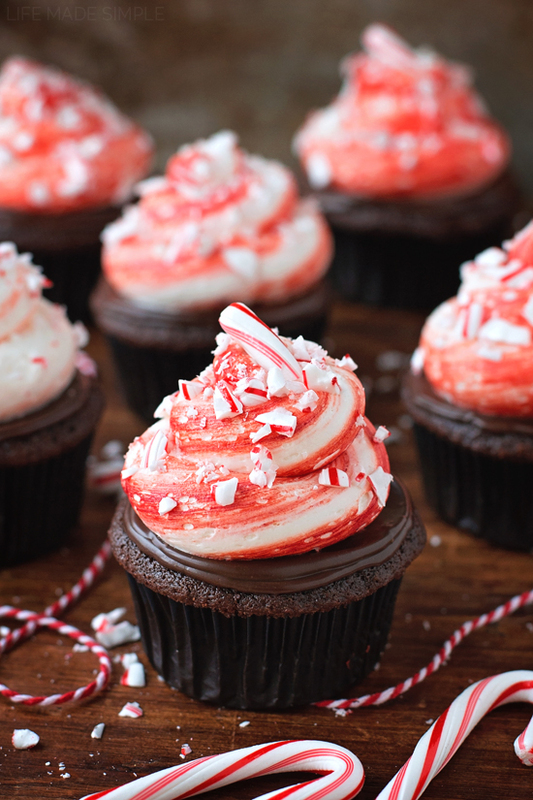 Embrace the holiday season with these festive chocolate peppermint cupcakes. 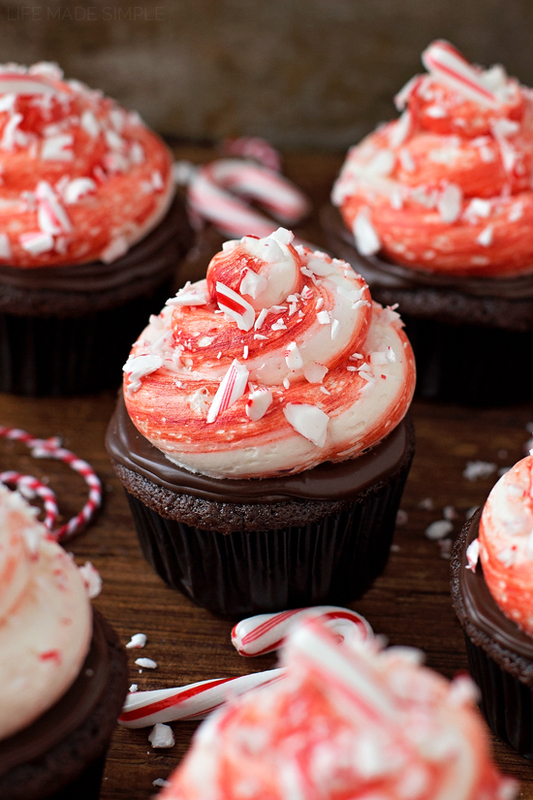 They're topped with ganache, peppermint buttercream and crushed candy cane. Bake cupcakes according to the directions, allow them to cool completely. To prepare the ganache, in a 2 c. glass measuring cup, combine chocolate chips and heavy cream. Microwave on half powder (mine is usually power 10, so I did 5) for one minute, stir, then repeat. Stir chocolate until all of the chips are melted and it becomes smooth. Beat for 1 minute and then spoon over the cupcakes. To prepare the vanilla buttercream, in the bowl of a stand mixer fitted with the whisk attachment, beat butter until smooth, about 1 minute. With mixing speed on low, add the vanilla extract, peppermint extract, salt, and powdered sugar. The mixture will look clumpy, that's ok. Add the heavy cream and gradually increase mixing speed to high. Beat for 2-3 minutes or until the frosting is light and fluffy. Remove and place into a large piping bag fitted with a large round tip, swirled with red gel food coloring (just take a tooth pick and swirl it all around inside the bag, it'll look like a mess but it works), pipe onto the cupcakes. Sprinkle with crushed candy cane. 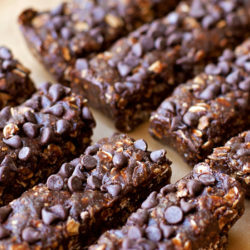 -Feel free to use your favorite chocolate boxed mix for the base of this recipe. 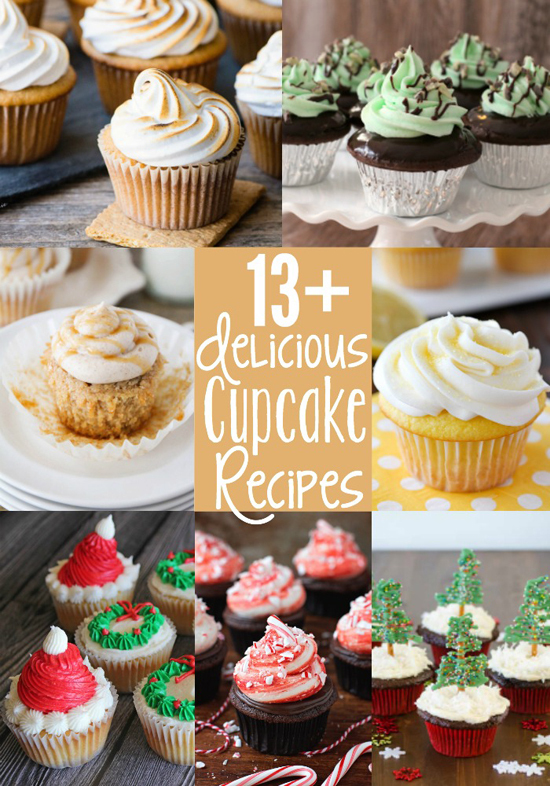 hey girl these look amazing! Yummy! Yummy! These look incredible! I have to make these, Love the swirly icing. I tried your swirl technique with the frosting and colored gel and the swirl faded out far too fast. I got maybe 3 – 4 cupcakes out of a dozen. Maybe using a food dye with a decorating brush would work better and last longer? I did use a large 18 inch pastry bag, I wonder if that may be the issue? Hi- I made these for Christmas! Should they be stored in the refigerator or are they ok left out overnight?